Maryland's economy continues to outperform the country as a whole. Information technology, telecommunications, aerospace, and defense are leading forces behind the Baltimore-Washington economic growth. Howard and Anne Arundel counties boast a thriving and vibrant economy, which makes it the first choice for smart businesses looking to start or expand in the Mid-Atlantic area. Add in its central location between Baltimore and Washington, D.C. coupled with significant growth in the industrial and residential sectors the demand for land, retrofit buildings, zoning and transportation creates a significant market demand. . These counties offer the unique advantage of a central location directly between Washington, D.C. and Baltimore. 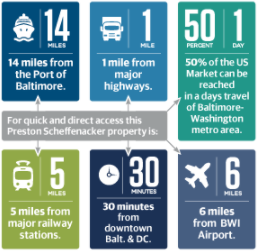 With easy access to a range of transportation options, one of the most densely concentrated tech industries in the country—and to leading government agencies such as the The Centers for Medicare and Medicare, Fort Meade, and Northrup Grumman.